Mammals are among the most familiar—and the most diverse—life-forms. Featuring more than 450 full-color photographs and illustrations, Exploring the World of Mammals provides more than 100 informative articles describing in detail specific groups of mammals, such as bears, cats and dogs, and families of carnivores, herbivores, or omnivores. 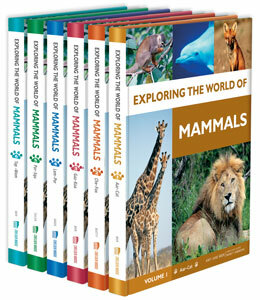 This engaging set illustrates key life-science principles while presenting thorough information in alphabetical format on the mammals of the world, covering important topics such as anatomy and physiology, food chains, interspecies partnerships, and principles of evolution and survival. Readers will learn about the life cycle of major mammals, as well as their hunting, feeding, and breeding habits. Core curricula topics such as adaptation, environment, ecosystems, habitats, and physical processes are also addressed in this invaluable set. Content from this set meets the Texas Essential Knowledge and Skills for science, New York State Learning Standards for science, and the California State Board of Education Standards for science for grades 5-7. "Fun Facts" and “Did You Know?” boxes highlighting key topics such as breeding, conservation, and evolution. "The layout is colorful, open, and appealing...Bright photographs and illustrations...a worthwhile addition to school and public libraries." "...easy-to-understand text...would be a welcome addition in most middle school libraries as well as the children's reference section of most larger public libraries." "...excellent...much of the information [will] be of interest...This set will be a valuable addition to the classroom or school library."